The front page of Jornal de Angola on December 5. 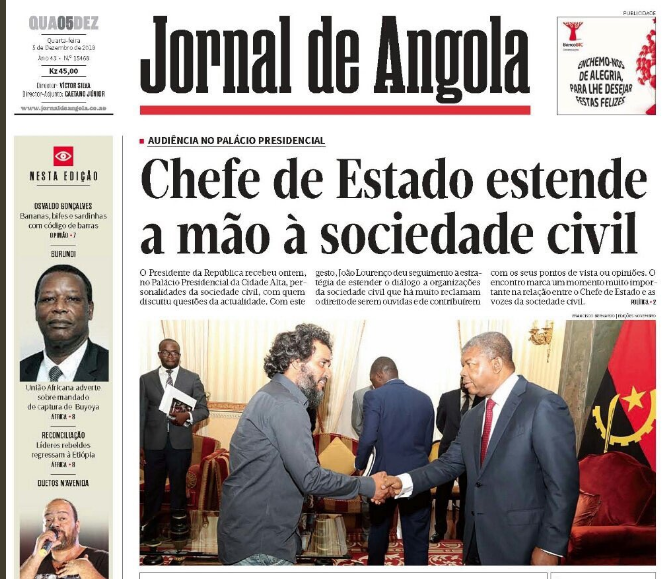 The headline says: “Head of state extends a hand to civil society.” The photo shows: President João Lourenço shakes hands with Luaty Beirão, convicted in 2016 to 5 and half years in prison for “plotting acts of rebellion.” Photo: Screenshot of a facsimile of Jornal de Angola. The Angolan President João Lourenço held formal talks with civil society organizations, journalists and activists critical of the government on December 4 at the Presidential Palace in an unprecedented move for a head of state in that country. The meeting appears to signal a pivot from his predecessor José Eduardo dos Santos, who presided over Angola since its independence in 1975, and whose administration became notorious for its ill-treatment of activists, journalists, and international NGOs. João Lourenço was elected in September 2017 after succeeding Santos in the ruling MPLA party’s leadership and has since announced broad reforms, from the economy to the media, as well as purged several high-level officials connected with the Santos family. Among the invitees to the Palace on December 4 were journalist Rafael Marques and rapper Luaty Beirão, who both made international headlines in 2015 and 2018 after they were charged, in separate cases, with “insulting public authorities” and “planning acts of rebellion” respectively, among other charges. In June 2015, Beirão was arrested along with 16 other activists during a group study session of the book “From dictatorship to democracy: A conceptual framework for liberation,” by Gene Sharp. In March 2016, they all received jail sentences varying between two and eight years, which were converted to house arrest three months later. Marques faced the courts in June 2017 for an article he wrote in 2016 alleging that then-Attorney General João Maria de Souza had engaged in corrupt dealings to acquire a sizeable beachfront property. He was acquitted of all charges in July 2018. His journalistic work on corruption has landed him in jail several times since 1999. Luaty Beirão recalled his ordeal on Twitter before the meeting with João Lourenço. President João Lourenço encouraged me today to continue my investigations on corruption and to refer the cases to the Attorney General’s Office. The meeting of João Lourenço and members of civil society! I liked the president’s initiative! Yesterday they were seen as criminals for defending the people, today they are seen as great defenders of the truth. Other people present at the meeting were José Patrocínio, leader of the Omunga Religious Association, Alexandra Semeão of Handeca Association and Maria Lúcia Silveira of the Justice, Peace, and Development Association. Speaking with the press after the meeting, they said they were “allowed to express all concerns candidly and without apprehension”, according to SAPO Angola.